SCHOOL staff, parent volunteers and army personnel worked around the clock to clean up after violent storms in Brisbane’s north-west last Sunday closed three Catholic schools and caused considerable damage to a church and a hall. Three Catholic schools – All Saints at Albany Creek, St Andrew’s at Ferny Grove and St Peter Chanel at The Gap – were closed last Monday. Two others (at Grovely and Mitchelton) were operating at reduced capacity. And damage to the St Peter Chanel Church and hall at The Gap has caused a headache for organisers of today’s farewell to the Marist Fathers who are leaving the St Johns Wood-The Gap parish. St Andrew’s principal John Leyden said it had been “an absolute god moment” when he saw staff working so hard alongside parents to get the school up and running again. “They worked non-stop on Monday and Tuesday so the school was ready to recommence operation on Thursday,” he said. A spokesperson for Brisbane Catholic Education told The Catholic Leader that St Peter Chanel School had not been as fortunate as St Andrew’s. Energex power poles outside the school were brought down by the high winds resulting in a total loss of power. “Even by Tuesday power had not been restored to the area so that carpet dryers and the like could not be used in the clean-up,” the spokesperson said. It was hoped that the school would be back in operation by Thursday (November 20), he said. All Saints School returned to full operation last Tuesday. Parish priest Mitchelton and Grovely Fr Frank Lourigan said the churches at Mitchelton and Grovely had suffered minor damage, and the Sacred Heart Church at Samford had its large shade sail ripped away. 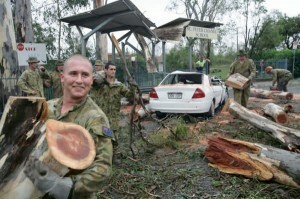 Albany Creek parish secretary Rita di Mauro said the worst problem at the church was a large tree which had been blown down and was lying in the church carpark.